Polka dots don’t need any season or occasion. These friendly dots coming in various colours, shapes and sizes are a fresh way to enter or exit any season – whether it is spring, summer or monsoon. That’s pretty convenient for us now since we really are not sure what season this is! It’s listed as Falgun (spring) in the Bengali calendar, though it rains like monsoon and feels like winter! It’s as if weather itself is confused this year on what season it’s supposed to be. When in doubt, go for prints. There is nothing as revitalizing and uplifting as polka dots. They bring swag in Western outfits, add feminine grace in dresses and put panache in traditional clothing. Here are some ways you can make creative use of these timeless prints. The print that is often associated with Minnie Mouse doesn’t need to look infantile all the time. Sure, we all dote on pretty polka dotted dresses and skirts. But if you are looking for something with more steel and confidence, a white jumpsuit with black dots could be your perfect style solution. Add a glittery gold belt to provide some relief in this stoic style. Keep the makeup fresh and vivid. Wearing monochromes means you can finally put on your favourite red lipstick without looking too loud. Size doesn’t matter but shape does. With the trend of wearing dresses that have zigzag cutting, stray from the uniform style and go for something more whimsical. It could be a polka dotted dress of any colours that is shorter at the front and longer at the back. You could opt for tunic that might look double your size but adds vogue and comfort to your style. Finally you could apply this formula to street styling. A full-sleeved white shirt can be worn with polka dotted red shorts. Plain crop tops go great with polka dotted leggings. If you are wearing a polka dotted dress, make it more feminine by adding laces and ribbons. You will see how easily the dress transforms from a casual style to party style. Accessorize it right and you are fit for a party. Polka dots with floral prints might look like a silly idea at first glance but the amalgamation can actually do more virtues than vice. Think of a floral red shirt or fotua with green or blue flowers worn with a pair of red leggings with white polka dots. Add a shiny stiletto to this style and make sure the handbag is perfect for the occasion. 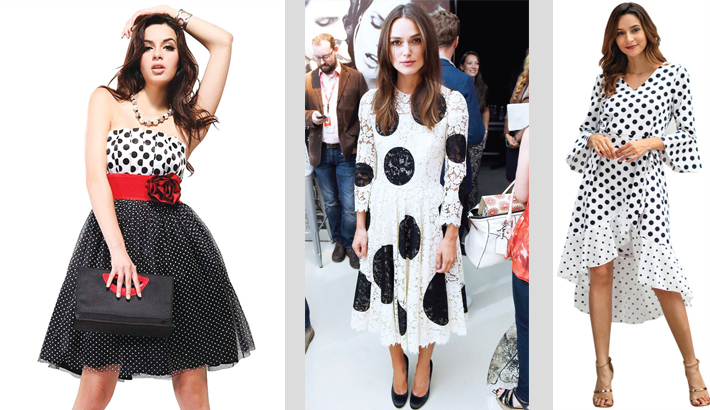 Why should you have all the fun with polka dots only in western outfits? If a polka dotted sari is too much for you, you could wear a plain colored sari with full sleeved polka dotted blouse. Impress your friends with this 80’s look. Don’t forget to accentuate your eyes with kajol!